将数据与他人共享时才可最大程度地发挥它的作用 - 了解如何发布、导出、共享和分发 Power BI 数据见解。Data is most powerful when shared with others - learn how to publish, export, share, and distribute your Power BI data insights. 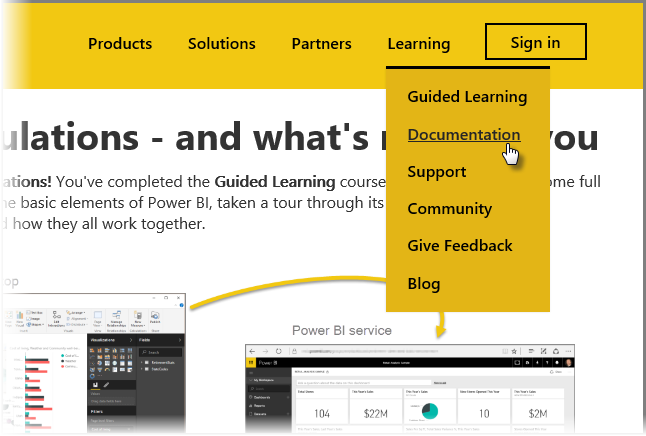 欢迎进入有关 Power BI 引导学习课程的发布和共享部分。Welcome to the Publishing and Sharing section of the Guided Learning course for Power BI. 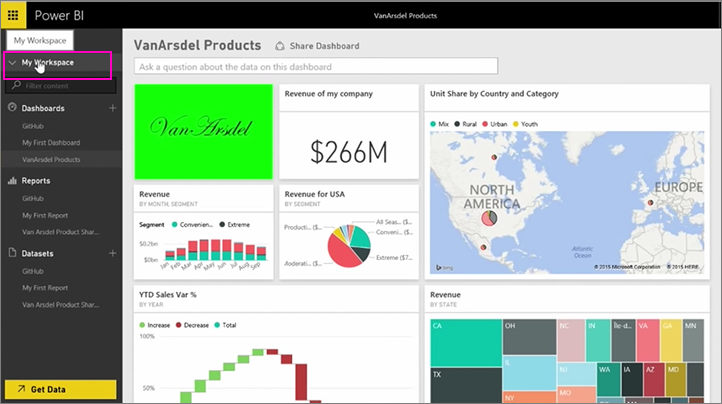 现在，你已经了解了 Excel 和 Power BI 如何无缝地协同工作，并且你已了解有关可以在报表和仪表板中创建的视觉对象的所有信息，建议将其与同事和朋友共享。Now that you've learned how Excel and Power BI work seamlessly together, and you've learned all about the visuals you can create in reports and dashboards, you likely want to share them with your coworkers and friends. 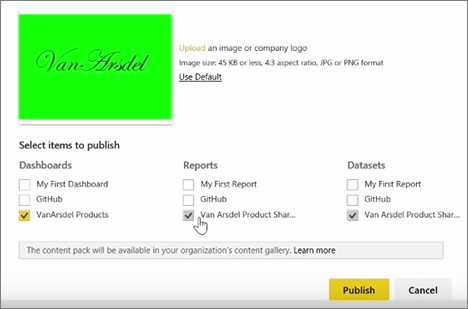 你可以使用 Power BI 轻松完成发布和共享操作。With Power BI, publishing and sharing are easy to accomplish. 创建打包仪表板、报表和数据集的内容包，并将之发送给同事。Create Content packs that package up a dashboard, report, and dataset to send to your colleagues. 他们可以将其作为起点并进一步增强它。They can use it as a starting point and further enhance it. 创建组，你可以使用该组作为安全模型以确定你创建的具有仪表板、报表和数据集访问权限的用户子集。Create Groups, which you can use as a security model to identify a subset of users who have access to dashboards, reports, and datasets you create. 在此模块的绝大部分，我们将使用设置新的财务组的方案。Throughout much of this module we use the scenario of setting up a new finance group. 我们将演示如何设置组、将仪表板、报表和数据集共享进组，并添加将具有访问组中项目的权限的成员。We'll show how to set up the group, share dashboards, reports, and datasets into the group, and add members who'll have access to the items in the group. 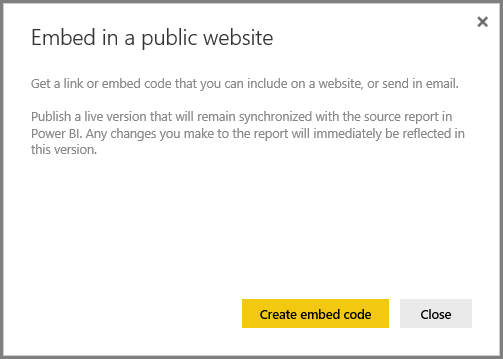 将报表发布到 Power BI 服务既快捷又方便。Publishing your reports to the Power BI service is fast and easy. 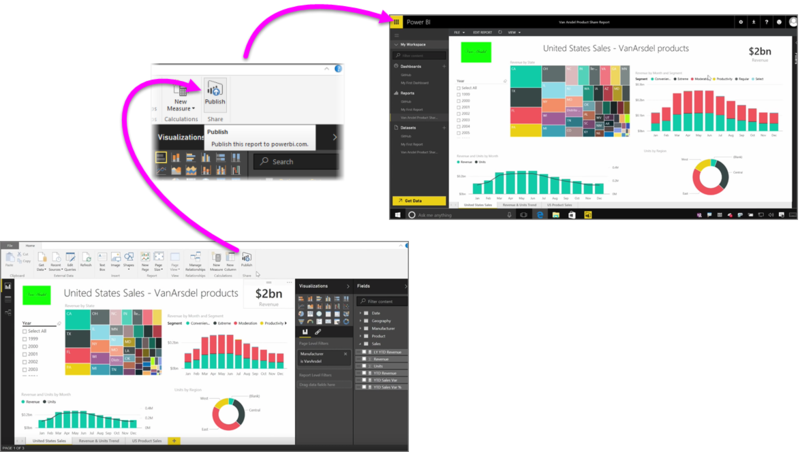 在 Power BI Desktop 中完成报表创作后，只需选择 Power BI Desktop 中的主页选项卡上的发布按钮，即可开始该过程。Once you've completed authoring your report in Power BI Desktop, just select the Publish button on the Home tab in Power BI Desktop, and the process begins. 你的报表和数据（包括可视化效果、查询和自定义度量值）将一起打包并上传到 Power BI 服务。Your report and data, including visualizations, queries, and custom measures, are packaged together and uploaded to the Power BI service. 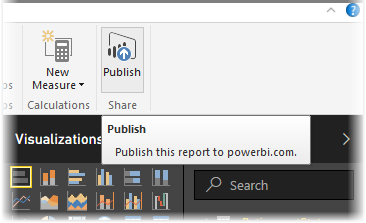 注意：Power BI Desktop 报表常称为 .pbix 文件（Windows 中为其提供的扩展名）。It's common to refer to Power BI Desktop reports as .pbix files, which is the extension they're given in Windows. 上传完成后，对话框将提示你发布进程已成功，并在该对话框中提供一个链接，在 Web 浏览器中将你直接转到 Power BI 服务中的报表。Once the upload is complete, a dialog box tells you the publishing process succeeded and a link is provided in that dialog to take you directly to your report in the Power BI service, in a web browser. 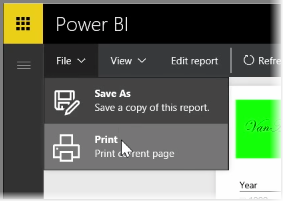 就是这么简单，你可以轻松将报表从 Power BI Desktop 发布到 Power BI 服务。And that's it - it's easy to publish reports from Power BI Desktop to the Power BI service. 有时可能需要在会议中使用打印的报表或仪表板，以便与他人共享这些内容。Sometimes you may want to bring a printed report or dashboard to a meeting, or so you can share it with others. 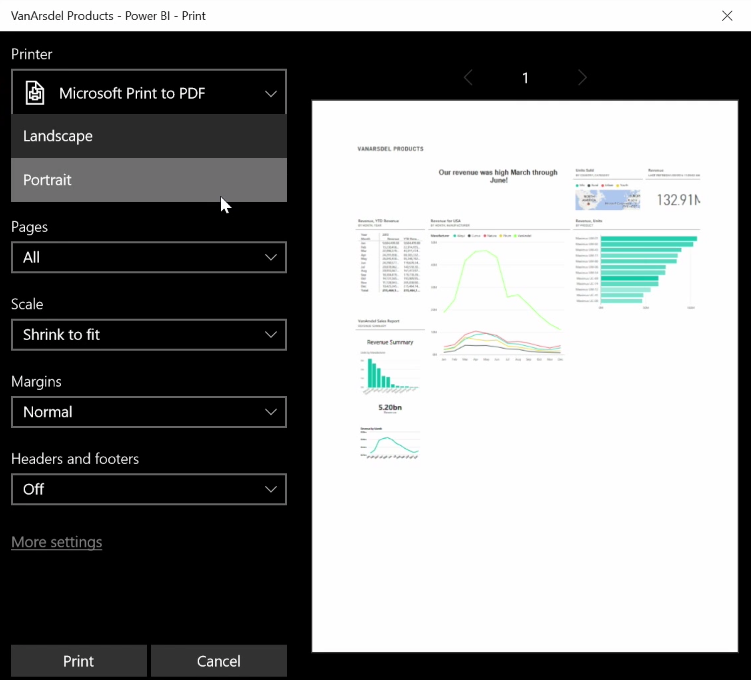 借助 Power BI，即可通过几种方式打印输出视觉对象。With Power BI, there are a few ways you can make printouts of your visuals. 在 Power BI 服务中，选择服务右上方的省略号（三个点），然后选择打印仪表板。In the Power BI service, select the ellipses (three dots) in the top-right side of the service, and select Print dashboard. 将显示打印对话框，你可以从中选择将仪表板发送到哪一台打印机，以及标准打印选项，如纵向或横向打印方向。A Print dialog appears, where you can select the printer to which you want to send the dashboard, as well as standard print options such as portrait or landscape orientation. 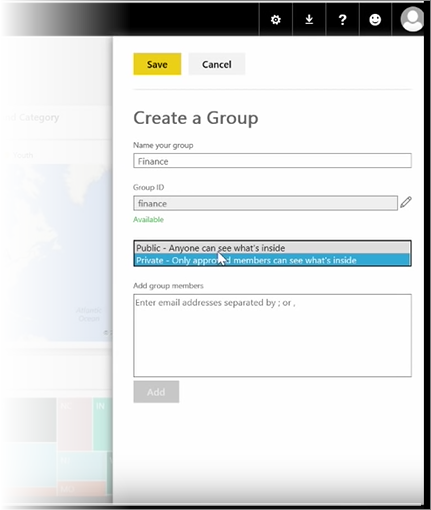 你还可以从 Power BI 服务中的任何其他视觉对象导出数据。You can also export the data from any visual in the Power BI service. 只需选择任一视觉对象上的省略号，然后选择导出数据按钮（中间的按钮）即可。Just select the ellipses on any visual, and then select the Export data button (the middle button). 当你执行此操作时，将创建一个 .CSV 文件并将其下载到本地计算机，并且浏览器上将显示一条消息告（就像任何其他由浏览器启动的下载）知你下载已完成。When you do so, a .CSV file is created and downloaded to your local computer, and a message appears on your browser (just like any other browser-initiated download) letting you know the download is complete. 你还可以从报表中直接打印或导出。You can also print or export directly from a report. 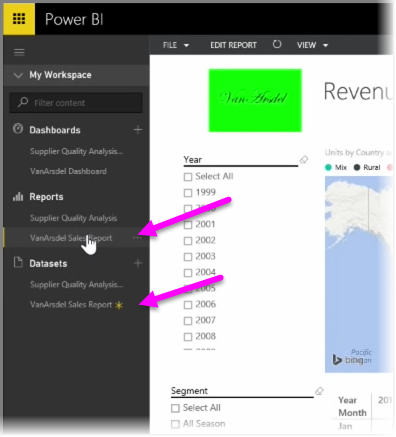 在 Power BI 服务中查看报表时，请选择文件 > 打印以打开打印对话框。When viewing a report in the Power BI service, select File > Print to open the print dialog. 就像仪表板一样，你也可以通过选择视觉对象上的导出按钮，从报表中视觉对象导出数据。And just like with a dashboard, you can export data from a visual within a report, too, by selecting the export button on a visual. 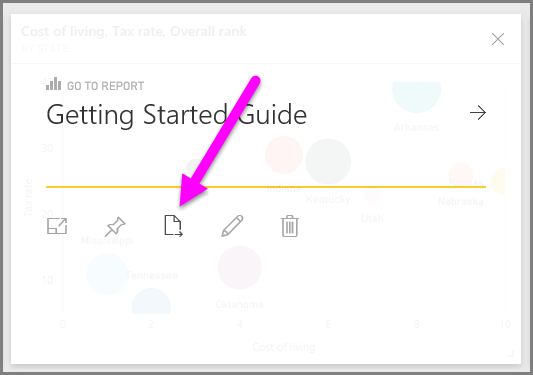 你可以更新已从 Power BI Desktop 发布到 Power BI 服务的报表和数据集。You can update reports and datasets that you've already published from Power BI Desktop to the Power BI service. 若要执行此操作，请从功能区的主页选项卡上选择发布。To do so, select Publish from the Home tab in the ribbon. 发布已存在于 Power BI 服务中的报表时，系统将提示你确认是否要将以前的数据集和报表替换为编辑后的版本。When you publish a report that already exists in the Power BI service, you're prompted to confirm that you want to replace the previous dataset and reports with the edited version you just chose to update. 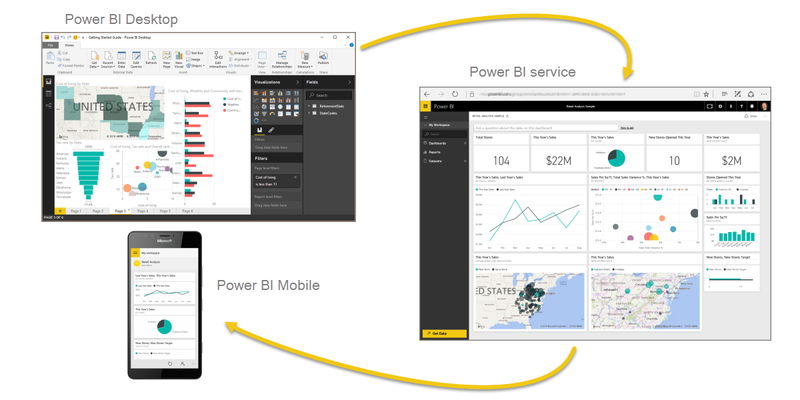 选择替换后，Power BI Desktop 最新版本文件中的数据集和报表将覆盖 Power BI 服务中的数据集和报表。When you select Replace, the datasets and reports in the Power BI service are overwritten with the datasets and reports in the most recent Power BI Desktop version of the file. 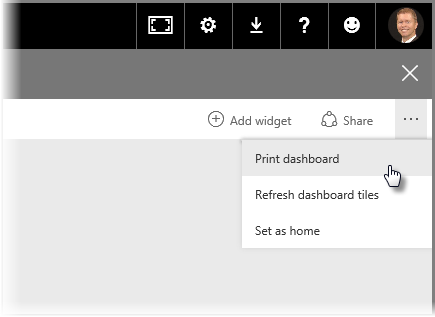 与 Power BI Desktop 中的其他发布事件一样，你将看到一个对话框，显示发布事件已成功，并获得 Power BI 服务中报表的链接。And just like any other Publish event from Power BI Desktop, you see a dialog that tells you the publish event was successful, and you get a link to the report in the Power BI service. 这是手动刷新数据的一种方法。This is a way to manually refresh your data. 也可以自动更新数据集和报表；该过程在另一个学习主题中有介绍。You can also automatically update datasets and reports; that process is covered in another learning topic. 如果你想在移动中对数据进行跟踪，你可以使用适用于 iOS、Android 和 Windows 设备的其中一个 Power BI 移动应用程序。If you want to keep track of your data while you're on the move, you can use one of Power BI's mobile applications for iOS, Android, and Windows devices. 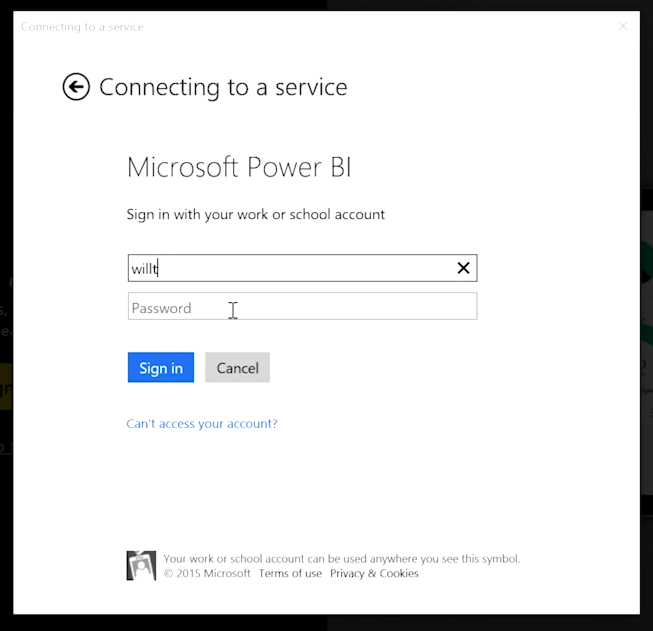 当使用 Power BI 应用时，请首先使用 Power BI 服务帐户信息登录你的帐户。When using the Power BI app, first sign in to your account using your Power BI service account information. 在 Windows 移动设备上（在此示例中为平板电脑），“登录”如下所示。On a Windows mobile device (in this case a tablet), the sign in looks like the following. 你将看到的第一个屏幕中显示了你可以访问的所有内容，包括报表、仪表板和组。The first screen that you'll see displays all of the content to which you have access, including reports, dashboards, and groups. 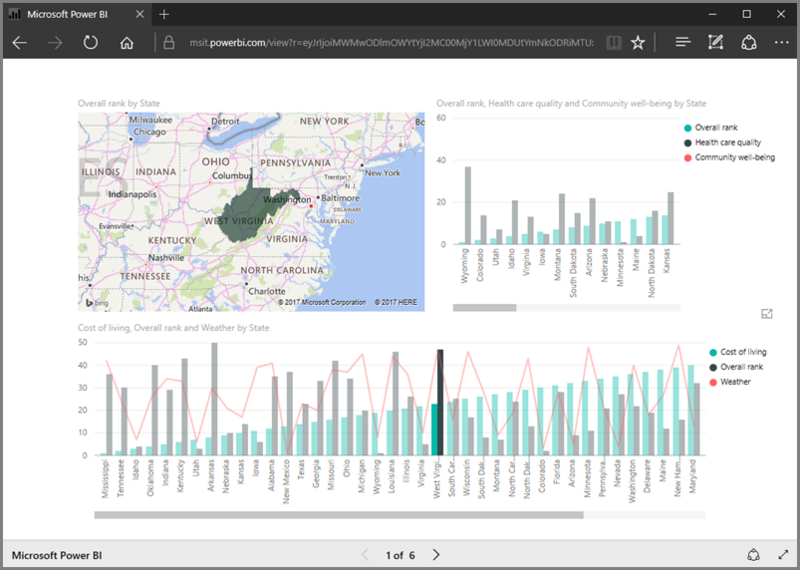 也有你可以用于获得灵感，或只是查看 Power BI 功能的示例仪表板。There are also sample dashboards you can use to get inspired, or just to see Power BI's capabilities. 该应用设计成便于触摸：点击仪表板或报表以全屏查看并使用手指滚动浏览。The app is designed to be touch-friendly: tap on a dashboard or report to view it full-screen and scroll through them using your finger. 你可以通过点击打开任何仪表板。You can open any of the dashboards by tapping on them. 在仪表板内，你可以点击仪表板磁贴以在较大的视图中聚焦它。Within a dashboard, you can tap on a dashboard tile to focus on it in a larger view. 你还可以通过点击右上角的批注按钮批注任何你发现的见解。You can also annotate any insights that you discover by tapping the Annotate button in the top right corner. 这使你能够在聚焦的磁贴上进行绘制，以突出显示感兴趣的特定区域。This allows you to draw on a focused tile to highlight particular areas of interest. 批注工具位于屏幕底部。The annotation tools are found along the bottom of the screen. 通过点击右上角的共享链接共享已批注的磁贴。Share your annotated tile by tapping the Share link in the top right-hand corner. 点击右上角的报表以查看磁贴的基础报表。Tap the Report link in the top right-hand corner to view the underlying report for a tile. 这将显示与你在 Web 浏览器或 Power BI Desktop 中所看到的完全一样的可视化效果，还包括了通过点击条形图、向下钻取或使用切片器与报表进行交互的功能。This will display the exact same visualizations that you would see in a web browser or in Power BI Desktop, and also include the ability to interact with the report by tapping on bars, drilling down, or using slicers. 在本课程中，我们首先创建组。In this lesson, we start by creating a group. 组定义了一组有权访问特定仪表板、报表和数据的用户。A group defines a set of users who have access to specific dashboards, reports, and data. Power BI 中的组基于 Office 365 中的组，因此如果你已使用了 Office 365 组来管理组的电子邮件、日历和文档，那么你会发现 Power BI 提供了相同的功能等。Groups in Power BI are based on groups in Office 365, so if you've been using Office 365 groups to manage your group's email, calendar, and documents, you'll see that Power BI offers the same features, and more. 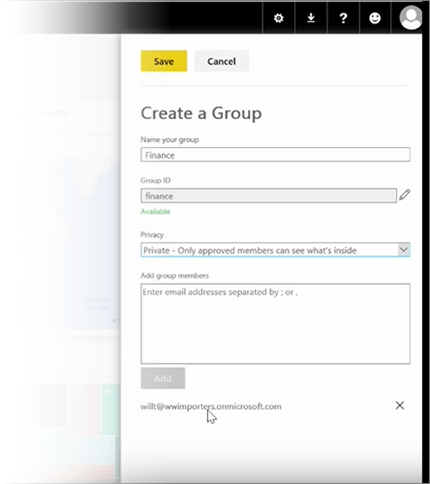 当你在 Power BI 中创建组时，实际上是在创建 Office 365 组。When you create a group in Power BI, you're actually creating an Office 365 group. 此模块使用设置新的财务组的方案。This module uses the scenario of setting up a new finance group. 我们将演示如何设置组、将仪表板、报表和数据集共享进组，并添加将具有访问组中项目的权限的成员。We'll show how to set up the group, share dashboards, reports, and datasets into the group, and add members who'll have access to the items in the group. 我在“我的工作区”中开始。I start here in My Workspace. 这些是我已创建或他人与我共享的仪表板、报表和数据集。These are the dashboards, reports, and datasets that I've created or that someone shared with me. 如果我展开“我的工作区”，我可以选择创建组。If I expand My Workspace, I can select Create a group. 此处我可以为其指定名称。Here I can give it a name. 我们正在使用该方案或财务组，因此我将称它“财务”。We're using the scenario or a finance group, so I'll call it Finance. 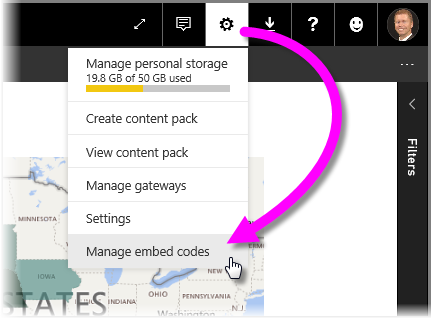 Power BI 可确保域上不存在该名称。Power BI makes sure the name doesn't exist on the domain. 我通过确定是否允许组织中的任何人或仅其成员可以查看组的内容，来设置隐私级别。I can set the privacy level by deciding whether anyone in my organization can see the contents of the group, or only its members. 我在此处键入电子邮件地址、安全组和通讯组列表。I type email addresses, security groups, and distribution lists here. 我选择添加以使他们成为组员，并保存该组。I select Add to make them members of the group, and save the group. 继续下一课程！On to the next lesson! 在本课程中，我们将使用 Power BI 中现有的项目创建内容包，然后与同事共享。In this lesson, we create a content pack with existing artifacts we already have in Power BI, and then share those with colleagues. 在我的工作区中有一个仪表板、仪表板下面的报表和数据集。In My Workspace I have a dashboard, the report underneath, and the dataset. 我希望将它们作为一个包与我的组织中的人员共享，以便他们可以重用这些项目。I want to share them as a package with people in my organization, so they can reuse them. 当我选择设置图标（位于服务右上角的齿轮）时，我可以看到我已使用多少存储空间，以及是否可以创建内容包。When I select the Settings icon (the gear in the top-right of the service), I can see how much storage I've used, and I can create a content pack. 在显示的对话框中，我可以选择是否将其分发到特定人员或组，以及是否还设置一个标题。In the dialog that appears, I can choose whether to distribute it to specific people or groups, and also give it a title. 在描述框中提供详细说明也是一个不错的想法，以便浏览内容包的人员知道该内容包包含什么或提供什么项目。It's also a good idea to provide a detailed description in the Description box, to people browsing for a content pack to know what it contains or what it provides. 在对话框的底部，我有机会上载内容包的图像，然后是最重要的步骤：我将选择我想要在此内容包中包括的仪表板，当我这样做时，Power BI 会自动选择仪表板中所使用的报表和数据集。On the bottom of the dialog, I have an opportunity to upload an image for the content pack, and then the most important step: I select the dashboard I want to include in the content pack, and when I do so, Power BI automatically selects the report and dataset that are used in the dashboard. 我无法取消选择报表或数据集，因为我要在内容包中包含的仪表板需要它们。I cannot unselect the report or dataset, because the dashboard I want to include in the content pack requires them. 我还可以选择其他仪表板、报表和数据集，但现在不选。I could also select other dashboards, reports, and datasets, but I won't now. 当我发布后，此内容包将被添加到组织的内容库中。When I publish, the content pack is added to the organization's content gallery. 在前面的课程中，我们已创建内容包和组。In previous lessons, we already created a content pack and a group. 在本课程中，我们将为组中的每个人创建内容包实例。In this lesson, we're going to create an instance of the content pack for everyone in the group. ...然后切换回我在前面的课程中创建的财务组。... and switch back to the Finance group I created in the earlier lesson. 该组没有任何仪表板、报表或数据集。The group doesn't have any dashboards, reports, or datasets yet. 我将使用自己创建的内容包。I'm going to use the content pack I created. 我浏览我的组织中的内容包，而不是来自第三方服务的内容包。I browse content packs from my organization rather than those from third-party services. 我找到一分钟前自己创建的内容包。I find the content pack I created a minute ago. 我明白了为什么为内容包设置适当的标题、说明和图像很重要，因为这样可以方便用户找到它。I see why it's important to give it a good title, description, and image, so people can find it. 我连接该内容包。I connect to it. 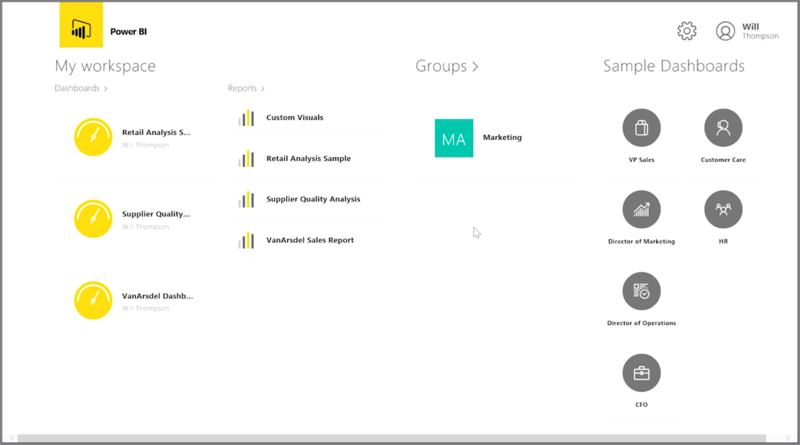 power BI 将导入内容包中的仪表板、报表和数据集。Power BI imports the dashboards, reports, and datasets that are in the content pack. 选择数据集时，Power BI 询问我是否想要对内容包进行个性化设置。When I select the dataset, Power BI asks if I want to personalize the content pack. 我将创建自己可以进行更改的内容包的副本，并将其与已发布版本的内容包断开连接。I'm creating a copy of the content pack that I can make changes to, and disconnecting it from the published version of the content pack. 如果内容包创建者对已发布的版本进行了更改，我不会自动获得这些更新。If the content pack creator makes changes to the published version, I won't automatically get those updates. 但如果我想，我可以编辑仪表板、报表，甚至数据集。But I can edit the dashboard, the report, and even the dataset, if I want. 因此内容包是一种重用组织中的其他人员创建的内容的简单方法。So content packs are a simple way to reuse content created by other people in your organization. 在本课程中，我们要编辑之前创建的原始内容包，并学习如何让已连接到此内容包的其他人知道这些更新。In this lesson, we're going to edit the original content pack we created previously, and see how that updates the other people who've connected to it. 我已返回到“我的工作区”，编辑我的原始仪表板。I'm back in My Workspace, editing my original dashboard. 每当我对仪表板进行任何更改，系统都会提醒我更改了内容包中和别人共享的一些东西，并提示我更新共享的版本。Anytime I make any change to the dashboard, I get this reminder that I've changed something that I've shared with others in a content pack, and prompting me to update the shared version. 我返回到设置图标并选择查看内容包以查看我已发布的内容包。I go back to the settings icon and select View content pack to see the content packs I've already published. 我看到自己所做的内容包。I see the content pack I made. 此小图标告诉我我已更改内容包中的一些东西，我需要编辑该内容包，以便其他人可以看到我的更改。This little icon tells me I've changed something in the content pack, and I need to edit the content pack so others can see my changes. 当我选择编辑时，我返回到可以编辑标题和说明的屏幕，但这次该屏幕中有一个更新按钮，因此我选择了该按钮。When I select Edit, I'm back at the screen where I can edit the title and description, but this time it has an Update button, so I select that. 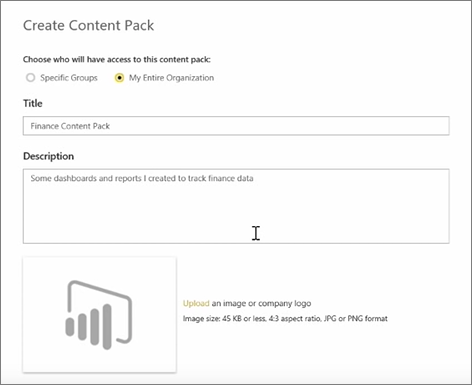 Power BI 接受了这些更改，并将更新的内容包发布到内容包库。Power BI takes those changes and publishes the updated content pack to the content pack gallery. 任何连接到我的内容包的人会收到一条消息，告知内容包已更改，并询问他们是接受所做的更改还是保留较旧版本。Anybody who has connected to my content pack gets a message that the content pack has changed, and asks if they want to accept the changes or keep the older version. 因此，作为内容包的所有者，你可以管理你的同事所使用的版本。So as the content pack owner, you can manage the versions that your colleagues are using. 在前面的文章中我们回顾了创建组来帮助组织管理 Power BI 中的内容并在此基础上进行协作。In an earlier article we reviewed creating groups to help your organization manage and collaborate on content that's in Power BI. 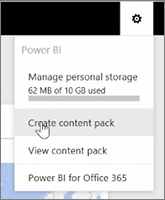 你还可以借助 OneDrive for Business 使用 Power BI / Office365 组进行协作和共享。You can also use your Power BI / Office365 groups to collaborate and share by using OneDrive for Business. 将 OneDrive for Business 用作 Power BI 内容的一个源，可以让你访问大量有用的工具，如版本历史记录。Using OneDrive for Business as a source for your Power BI content gives you access to a number of helpful tools, such as version history. 你还可以在 OneDrive for Business 中与Office365 组共享你的文件，以便向许多人授予访问权限，允许他们处理相同的 Power BI 或 Excel 文件。You can also share your files with an Office365 group from within OneDrive for Business to give access and allow many people to work on the same Power BI or Excel files. 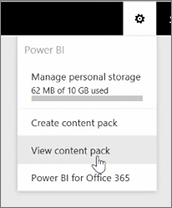 若要在 OneDrive for Business 上连接 PBIX (Power BI Desktop) 文件，请登录 Power BI 服务，然后选择“获取数据”。To connect to a PBIX (Power BI Desktop) file on OneDrive for Business, sign in to the Power BI service and select Get Data. 选择“导入”下面的文件，或选择“连接到数据”，然后选择 OneDrive - 业务。Choose Files under Import or Connect to Data, and then select OneDrive - Business. 突出显示所需的文件，然后选择连接。Highlight the desired file, and select Connect. 你的内容将显示在导航栏左侧。Your content appears in the left-hand side navigation bar. 现在，对 OneDrive for Business 上的文件所做的任何更改都将自动在 Power BI 环境中反映，并且在版本历史记录中记录。Now, any changes made to the file on OneDrive for Business will be automatically reflected in the Power BI environment as well, and recorded in the version history. 在本课程中，我们将了解如何通过简单几步在网页上或通过电子邮件共享 Power BI 报表。In this lesson, we learn how to share a Power BI report on a web page, or share it through email, in just a few simple steps. 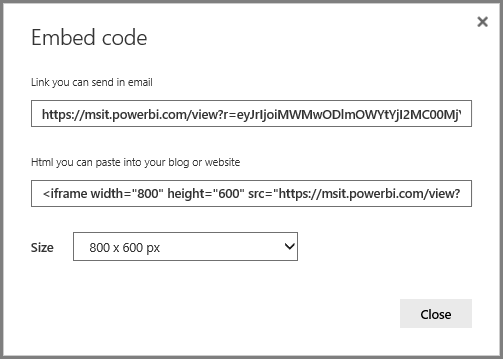 这项 Power BI 功能通常被称为“发布到 Web”，非常易于使用和管理。This feature of Power BI is often referred to as Publish to web, and it's easy to use and to manage. 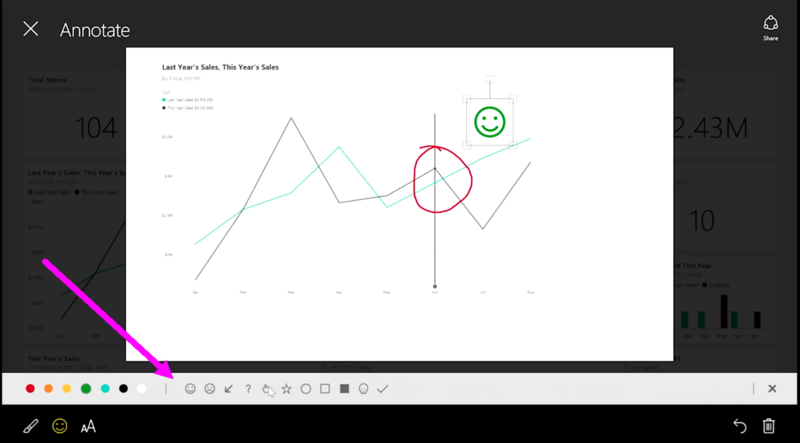 在 Power BI 中，选择要共享的报表，使其显示在画布上。In Power BI, select the report you want to share, so it's displayed on the canvas. 然后，在菜单中，依次选择“文件 > 发布到 Web”。Then from the menu, select File > Publish to web. 此时，你会看到一个对话框，提示你将生成在网站上或在邮件中添加报表所需的 嵌入代码 。From there, you see a dialog that explains you'll get an embed code that lets you include the report on a website or in mail. 选择“ 创建嵌入代码 ”后，Power BI 便会显示另一对话框，再次提示你即将与 Internet 上的所有人共享你的数据。When you select Create embed code, Power BI presents another dialog, telling you again that you're about to share your data with everyone on the Internet. 请务必确认共享！Make sure that's okay! 对于 HTML 链接，可以选择嵌入报表的预定义尺寸，也可以自行修改 iframe 代码并自定义报表尺寸。For the HTML link, you can choose from predefined sizes for the embedded report, or you can modify the iframe code yourself and customize its size. 还可以将 iframe 链接嵌入博文、网站或 Sway 中。You can also embed that iframe link into a blog post or website, or into Sway, too. 要删除所创建的嵌入代码？Want to delete an embed code you created? 没问题。No problem. 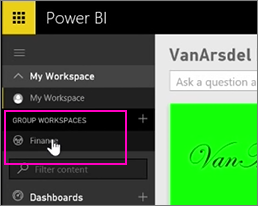 在 Power BI 中，依次选择右上角的齿轮图标和“管理嵌入代码”。In Power BI, select the gear icon in the upper right corner, then select Manage embed codes. 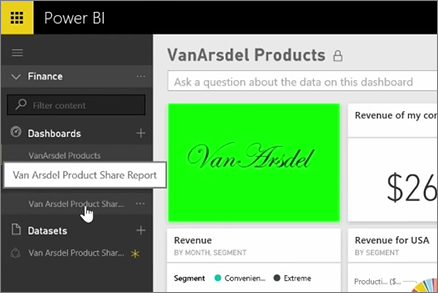 此时，Power BI 工作区会显示你已创建的嵌入代码（在下图中，只有一个嵌入代码）。The Power BI workspace shows the embed codes you've created (in the image below, there's just one). 单击省略号后，可以选择获取嵌入代码，也可以选择完全删除嵌入代码。When you click the ellipses, you can then select to get the code for the embed code, or delete the embed code entirely. 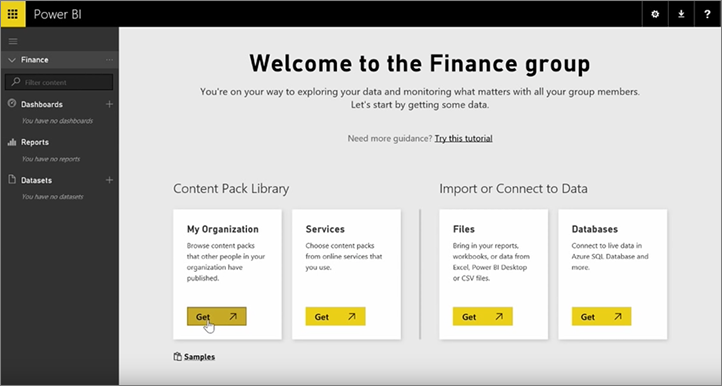 将 Power BI 报表发布到 Web 并与全球用户进行共享的演示到此结束了。And that's all there is to publishing your Power BI report to the web, and sharing it with the world. 操作起来非常简单！It's easy! 你做到了！You did it! 祝贺你！Congratulations! 你已经完成了 Power BI 的“引导学习”课程。You've completed the Guided Learning course for Power BI. 你已经学习了 Power BI 的所有基本元素、浏览了它的软件功能和元素，并学习了它们如何一起工作。You've come full circle from learning the basic elements of Power BI, taken a tour through its software features and elements, and learned how they all work together. 还提供了更多“帮助和参考”内容。There's more help and reference content available, too. 只需转到此页的顶部，并选择“学习>文档”以查看我们广泛的 Power BI 参考内容。Just go to the top of this page, and select Learning > Documentation to see our extensive set of Power BI reference content. 我们希望你能享受“Power BI 引导学习”的体验之旅。We hope you've enjoyed your journey through this Power BI Guided Learning experience. 祝你好运，愿你的 Power BI 视觉对象永远散发迷人光彩。Best of luck to you, and may your Power BI visuals always be immersive and compelling. 还想了解更多吗？Still want more? 你是否有兴趣了解如何在 Power BI 中使用 DAX（数据分析表达式） 进行创建、筛选，或者使用自定义列和表？Interested in using DAX (Data Analysis Expressions) to create, filter, or use custom columns and tables in Power BI? 还有一节专门针对想在 Power BI 中从事代码操作的用户，此节就是 DAX 简介。There's one more section targeted at people inclined to do some code work in Power BI, and it's called Introduction to DAX. 看看你是否感兴趣 - 此节中所用的方法与“引导学习”中的其他部分的方法一样简单。Take a look if you're interested - it uses the same friendly approach as the rest of Guided Learning. 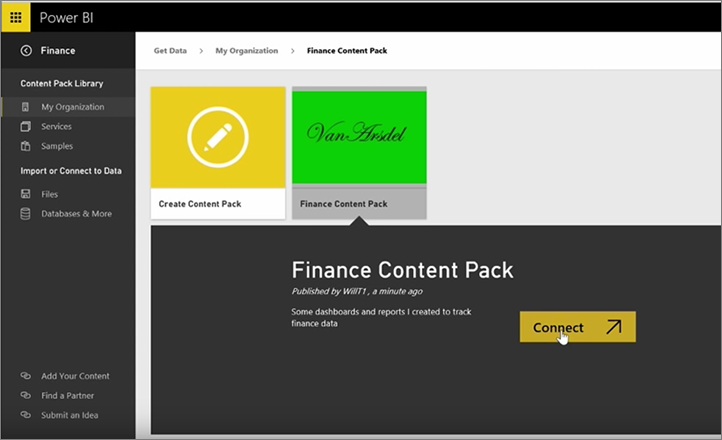 现已完成 Power BI 引导式学习教程的“发布和共享”部分。You've completed the Publishing and sharing section of Power BI Guided Learning. 如需 DAX（用于创建 Power BI 查询的语言）的简介，请转到下一篇教程。If you want an introduction to DAX, the language used to create Power BI queries, head to the next tutorial.